Galloway, NJ (May 16, 2013) — The countdown to the ShopRite LPGA Classic Presented by Acer has begun with three days of championship play set to begin on Friday, May 31 on the historic Bay Course at Stockton Seaview Hotel and Golf Club. The best players from the Ladies Professional Golf Association will be competing for $1.5 million. Beginning on Mon., May 27, a weeklong of activities is scheduled that lead up to the crowning of a new champion on Sunday, June 2. One of the more highly anticipated events is the Second Annual ShopRite LPGA Classic Presented by Acer Million Dollar Shootout. Regional golf enthusiasts have earned the chance to participate in the Shootout by winning a closest-to-the-hole contest at more than 25 participating clubs in the region. Many of those local qualifying clubs are members of the Greater Atlantic City Golf Association. “It's exciting for our member golf courses to be part of the event's fanfare. 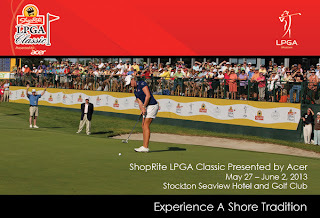 The presence of the Shoprite LPGA Classic Presented by Acer is one of the many indicators that Atlantic City is a premier golf destination,” said Thomas Sullivan, President of the Greater Atlantic City Golf Association. All eyes will turn to the 18th hole on Tuesday, May 28 at 3:00 p.m. to watch participants attempt to hit a 150-yard hole-in-one and collect the $1 million prize. The public is invited to join emcee Ricky Bottalico, former MLB pitcher and Phillies analyst for Comcast SportsNet, and LPGA players supporting those participating in the Shootout. All three rounds of championship play will be televised live on Golf Channel. For a complete list of tournament events, updates and ticket information, visit www.ShopRiteLPGAClassic.com or call 609.798.0222.